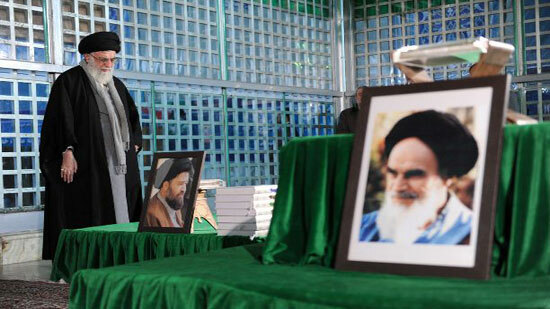 On the eve of the 39th anniversary of the Islamic Revolution, Ayatollah Seyyed Ali Khamenei attended the late Imam Khomeini's mausoleum on Wednesday to pay tribute to the founder of the revolution and the martyrs. The Supreme Leader of the Islamic Revolution also visited the tombs of the martyrs of the Eight-year Holy Defense (Iraqi-imposed war from 1980 to 1988) and the Islamic Revolution. The day of Imam Khomeini's return to Iran from exile (Feb 1, 1979) marks the beginning of the Ten-Day Dawn in ceremonies which culminate with the anniversary of the victory of the Islamic Revolution on February 11, 1979. Iranians toppled the US-backed Pahlavi regime 39 years ago, ending 2,500 years of monarchy in the country.